FM - Listening on FM is usually best for casual listening, it's free and available all over Hua Hin on a portable FM radio or car radio. 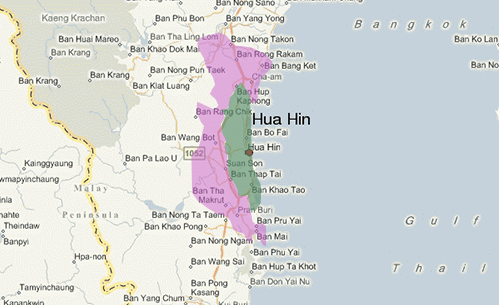 Our primary service area covers the beach side of the hills from just south of Cha-Am south through Hua Hin to Khao Tao, good reception is available up to and just over the hills at HinLek Fai and further in places. Fair reception is available out side our primary area but may be patchy due to the shadow effect caused by the hills, where you are located on the opposite side of the hill to the radio station. There are several types of interference which may effect reception such as. Electrical, atmospheric, Co-Channel and others. 1) Electrical interference, caused by overhead power cables sparking or have poor contact. 2) Some traffic lights and other signals may radiate interference. 3) LED lights and dimmer light switches. 4) Faulty electrics in the car such as air conditioning, brakes or an alternator. Occasionally weather conditions reflect distant radio signals into our area, this is most common during the dry season with clear skies, often at the beginning or end of the day as temperatures are in the process of change. This usually means interference from another radio station on the same channel or close to our channel 102.5. Many choose to listen via a tablet, phone, internet radio or music streaming system such as Sonos, this provides very reasonable quality audio. Ideally you would use the internet via a WiFi at home or building. We suggest you listen via our website: surf1025.com. A search on Google will show other listening options. If you regularly view streaming video on the go then you may need more, however radio - audio is much more economical. With cost and reliability in mind we stream at a low bit rate (64KBPS) which generally provides good reliability on the go while offering very reasonable audio quality. The advantage with the mobile network is you can listen on your mobile device, then connect that device via an audio cable or Bluetooth to your car audio system. You can then continue to use your mobile device for other activities while listening. The mobile data network allows reception all over the country and further. again, consider how much data you will need. There are few FM radio's available in stores, however several good Bluetooth speakers, some will also receive FM. 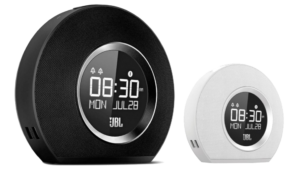 See this :JBL HORIZON clock radio.